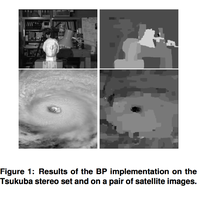 9 publications with the keyword "stereo"
A parallel robust relaxation algorithm is proposed to improve the detection and correction of illegal disparities encountered in the automatic stereo analysis (ASA) algorithm. Outliers and noisy matches from correlation-based ASA matching are improved by relaxation labeling and robust statistical methods at each stage of the multiresolution coarse-to-fine analysis. A parallel version of the relaxation labeling algorithm has been implemented for the MasPar supercomputer. The performance scales quite linearly with the number of processing elements and scales better than linear with increasing work load. The algorithm is highly scalable both as the number of processors are increased for solving a fixed size problem and also as the size of the problem increases. K. Palaniappan, J. Vass, and X. Zhuang. Parallel robust relaxation algorithm for automatic stereo analysis. SPIE Proc. 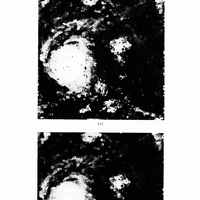 Parallel and Distributed Methods for Image Processing II, volume 3452, pages 958--962, 1998. Geostationary orbit provides a wonderful viewpoint for collecting movies of meteorological processes. Because GOES- 8 images are large and frequent, high-performance workstations and user-friendly software are required to review the current pools of GOES weather imagery at full resolution. 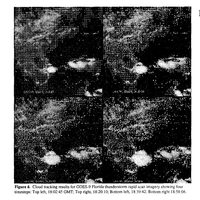 During the post-launch checkouts, the GOES-8 and GOES-9 satellites were exercised in rapid-scan imaging modes that challenge most display systems. 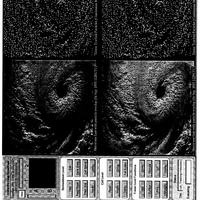 At NASA-GSFC, the Interactive Imaging Spread Sheet (IISS) software/hardware was used to roan and zoom through gigabytes of GOES image data collected in 1994-95. 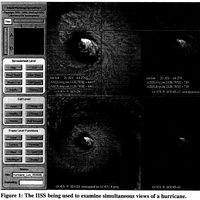 We use the IISS to examine exciting meteorological features within the hurricanes of 1995 and during typical episodes of severe weather that occur somewhere over the United States every day. The IISS demonstration shows how weather forecaster could make good use of the full resolution and depth of GOES-8 imagery, adapting to the meteorological even as it develops, especially when synchronized with corresponding weather radar. A. F. Hasler, D. Chesters, M. Jentoft-Nilsen, and K. Palaniappan. High performance animation of GOES weather images. SPIE Proc. on GOES-8 and Beyond, volume 2812, pages 80--83, 1996. Estimation of the atmospheric wind field based on cloud tracking using a time sequence of satellite imagery is an extremely challenging problem due to the complex dynamics of the imaging instruments and the underlying non-linear phenomena of cloud formation and weather. Cloud motion may involve both partial fluid motion and partial solid motion, which we model as semi-fluid motion. Motion algorithm with subpixel accuracy using differential geometry invariants of surfaces was developed to track clouds. The motion model is general enough to include both physical and geometrical constraints. Typically, a polynomial displacement function is used to model the local deformation behavior of a surface patch undergoing semi-fluid motion. 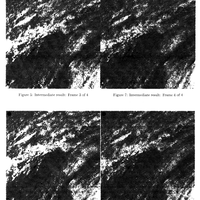 The cloud tracking algorithm recovers local cloud surface deformations using a sequence of dense depth maps and corresponding intensity imagery, that captures the time evolution of cloud-top heights. Either intensity or depth information can be used by the semi-fluid motion analysis algorithm. 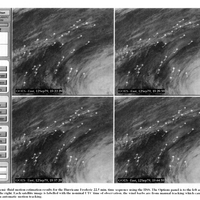 A dense disparity or depth map that can be related to cloud-top heights is provided by the Goddard Automatic Stereo Analysis module for input to the motion analysis module. The results of the automatic cloud tracking algorithm are extremely promising with errors comparable to manually tracked winds. 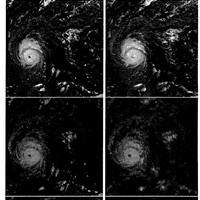 Experiments were performed on GOES images of Hurricanes Frederic, Gilbert and Luis, and a temporally dense 1.5 minute time interval thunderstorm sequence covering Florida region. Future work involves using multispectral information, incorporating robustness, cloud motion segmentation and adaptive searching for improving operational cloud-tracking performance. C. Kambhamettu, K. Palaniappan, and A. F. Hasler. Automated cloud-drift winds from GOES images. SPIE Proc. on GOES-8 and Beyond, volume 2812, pages 122--133, 1996.